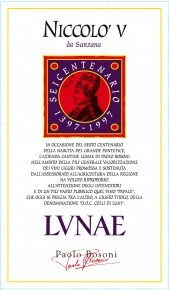 A gourgeous, elegant wine made in honor of Niccolo’ V, the Pope that was bown in the town of Sarzana, near the winery. A wine of great temper made with an accurate selection of the best grapes in the best vineyards. Sangiovese is blended with Merlot and Pollera Nera, a red grape that is grown nowhere else in Italy and which gives the wine a great local character. Ruby red in color with purple hues, Niccolo’ V is intense on the nose with hints of blackcurrant and cherry, accented by cedar and herb notes. Ripe and juicy, with a long, savory finish. Pair it with rich first courses and meat dishes. Colli di Luni is one of the few DOC appellations that straddles over two regions: the easternmost part Liguria (La Spezia) and neighboring coastal Tuscany (Massa Carrara). Everything about the Colli di Luni represents the transition between Liguria and Tuscany – the geography, the grape varieties, the wine styles. The key red-wine grape here is Tuscany’s principal red-wine grape Sangiovese, which forms the base (at least 50%) of any Colli di Luni rosso. A number of local varieties add their own unique twist to these blend, notably Canaiolo, Pollera Nera and Ciliegiolo. Sangiovese from this milder climate is usually more fruity than Sangiovese grown in Tuscany. Hand harvested. Maceration on the skins for 12 days then, after racking, the wine rests for 12 months in barriques followed by 6 months in bottle.